Waking Green Dragon: Some More Questions You Might Ask? Some More Questions You Might Ask? What environmental successes and disasters are you seeing? I lament, although I fear that the volume of my tears shall cause mudslides and further deluges, the weather here and the stunning inadequacies of various systems to accommodate the lacrimation of God. Today the story is about Sichuan, where I intend(ed) to take my summer vacation. 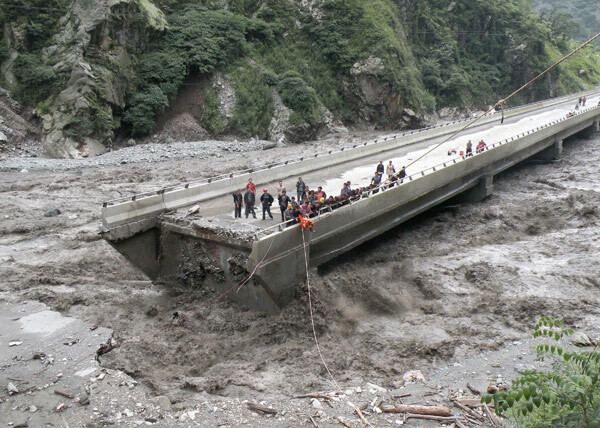 Rescuers have been battling to help people affected by mudslides brought about by intense rain in Yingxiu, Wenchuan county, Sichuan province, but officials and locals said on Tuesday that the situation on the ground still depends on the weather and whether they get more rain. The larger story was woven by my old friend Bill McKibben and a talented videographer some weeks back. Yesterday, the chilling irony of this story was not lost on my weak stomach. "Getting diarrhea from drinking too much may just have saved Lan Zhiming's life. The 22-year-old was scheduled to work the same shift as the 23 miners trapped in a coal shaft in Southwest China's Guizhou province. Instead, he was playing online games on Monday as rescuers desperately pumped out floodwater." A heavy rainstorm lashed Beijing on June 23, leaving many areas of the city waterlogged and throwing normal life out of gear. Since the rainfall was much higher than usual, it made headlines across the country. The outcomes of climate change have become more manifest in recent years. It was least expected that devastating floods would follow the debilitating drought in central and eastern China. So when torrential rain first began pounding the parched central and eastern plains, people welcomed it with a sigh of great relief. But soon the rain turned into a deluge and left people helpless. Such freak weather developments are likely to become more common. That's why the authorities should strengthen measures to ensure that droughts and floods cause the minimum possible damage. And it is very important that social management covers all sectors related to people's livelihood. Also, the authorities should realize that urban planning is crucial to dealing with extreme weather, especially because China has entered a period of rapid urbanization. Urgent action is needed. "By taking concerted action on several fronts, it is possible to curtail price volatility, reduce poverty and achieve long-term global food security. But we need to act now. The poor cannot continue to pay the high price of hunger because of our inaction." Write to your Senator and Congressman ad ask them to eliminate subsidies for corn ethanol. Causing starvation should not be the policy of a nation so full of "Christians." The Four Great Classical Novels (Chinese: 四大名著; pinyin: sì dà míng zhù) of Chinese literature, are the four novels commonly counted by scholars to be the greatest and most influential of classical Chinese fiction. I am reading Journey to the West and, if you are intrigued, you are now reading Wikipedia. Am I Becoming Increasingly Primitive?